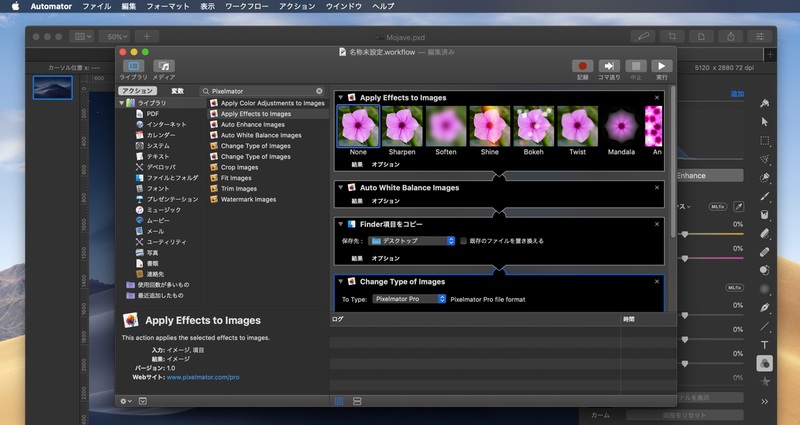 macOS MojaveのダークモードやSVGフォントをサポートし、Core MLでの写真自動修正機能が強化された「Pixelmator Pro 1.2 Quicksilver」がリリース。 | AAPL Ch. 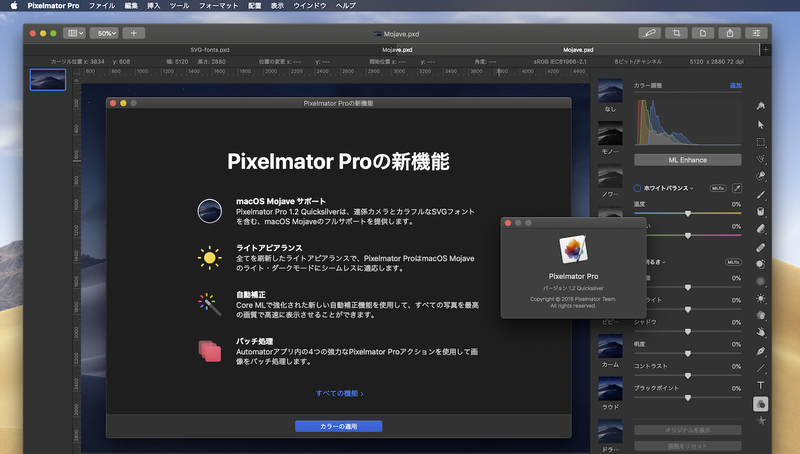 Pixelmator Pro 1.2 Quicksilver adds full support for macOS Mojave, includes a gorgeous new light appearance, Core ML-powered automatic photo enhancement, batch processing via Automator, and more. 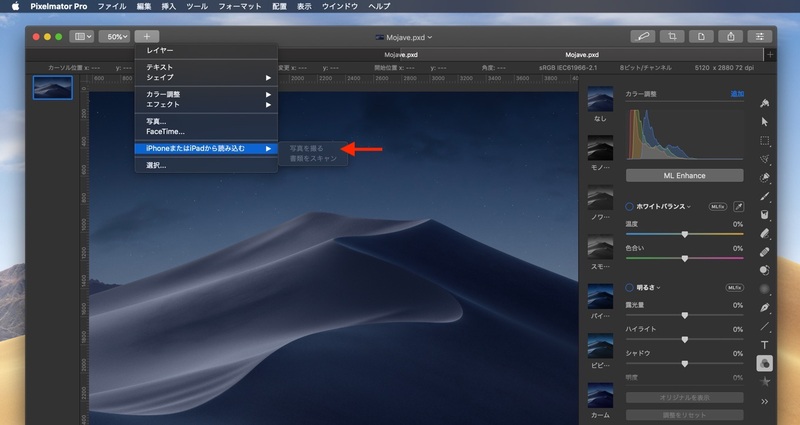 Pixelmator Pro is now fully compatible with macOS Mojave. A gorgeous new light appearance lets you experience Pixelmator Pro in a whole new way — change appearance any time in Pixelmator Pro preferences. Use ML Enhance to automatically improve the look of any photo using a machine learning algorithm trained on millions of professional photos. Batch process images using five powerful Pixelmator Pro actions in the Automator app — Apply Color Adjustments to Images, Apply Effects to Images, Auto Enhance Images, Auto White Balance Images, and Change Type of Images. 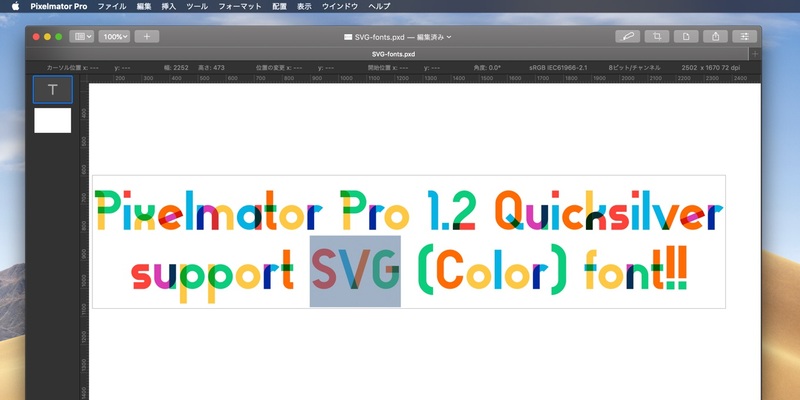 Create even richer, more vibrant graphics and designs with colorful SVG fonts — the Gilbert Color font is included with this update. Thanks to support for the Continuity Camera, you can now take pictures using your iPhone and have them instantly appear in the Pixelmator Pro document you’re editing. The Pixelmator Pro interface has been refined to more closely match the look of macOS in both light and dark mode. Accent color support means the buttons and sliders in Pixelmator Pro will now match your preferences. You can now change the color of the Pixelmator Pro window background in Pixelmator Pro preferences. The Pixel Paint tool now has an Eraser Mode. When scrolling inside the brush size text field to resize the retouching and distort tools, the ratio between the brush size and scroll speed was incorrect. Fixed. When opening images with no PPI information, the PPI will now be set at 72 by default, rather than 150. 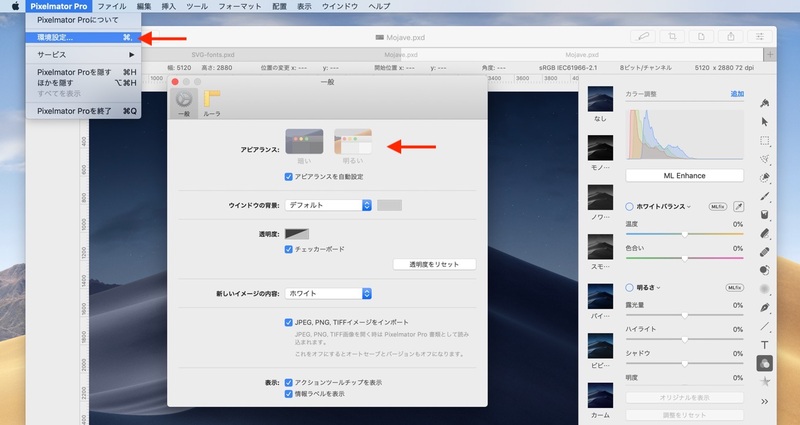 Closing a document while using the Quick Selection tool would occasionally cause Pixelmator Pro to quit unexpectedly. Fixed. The Color Selection tool was not working correctly in all images. Fixed.